As a reader, it can be very rewarding to visit a wholly imagined universe: I can’t recall how many hours I’ve spent immersed in the mythological back-stories of Tolkien’s Arda – and years before that, thinking about the many possible lands atop Enid Blyton’s Faraway Tree. But there are also writers who, while setting their stories in the real world – with recognisable human characters and geographical or anthropological detail – still create a mood that can properly exist only within their pages. Consider P G Wodehouse’s Blandings Castle (which, as Evelyn Waugh suggested, is just as inaccessible to us as the Garden of Eden, even though it’s located in the English countryside) and Gerald Durrell’s Corfu (the three books set there are technically memoirs, but Durrell’s account of the island and his sunshine-filled childhood are highly idealised and even a little unreliable). Damon Runyon’s Broadway – the Broadway of the post-Prohibition years – is another example of a real place and period being refashioned into a literary milieu that belongs solely to its author. Runyon is one of my favourite humour writers (I’d seat him in the pew just behind Wodehouse and S J Perelman) and his stories are populated by rogues of various stripes, from small-time gamblers, loan-sharks and their “dolls” to kidnappers and mobsters who aren’t averse to having their enemies “plugged”. 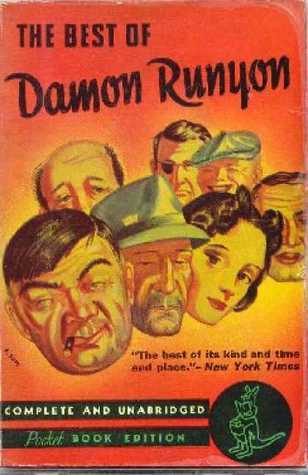 Such people certainly did exist in New York City in the 1920s and 30s (the colourful names – The Lemon Drop Kid, Dave the Dude, Harry the Horse and dozens of others – are drawn from real figures of the time), but Runyon defines them so sharply that you can’t tell how much of the writing is poetic exaggeration and how much is true to life. In his day job, Runyon dealt with cold facts; he was a well-regarded newspaperman. But the reporter’s ear for the cadences of speech must have served him well in his fiction writing. The unnamed narrator of the Broadway stories is a mild-mannered, somewhat nervous man whose own calling we never learn, but who seems to be confidante and (reluctant) associate to all the lowlifes you can imagine. His tone is amusingly deferential and mannered, but also sprinkled with colloquialisms and period slang (“puppies” for feet, “Judy” for woman) as well as deliberately awkward phrases (“She was no one but his own adoring mother”). The distinctive use of language in these stories helps create a self-contained world. In an introduction to the anthology On Broadway, the English humorist E C Bentley says of Runyon’s writing style: “There is a sort of ungrammatical purity about it that, to me at least, has the strongest appeal.” Read a few pages of any Runyon story and you’ll agree. The most noticeable quality is that he never uses the past tense. (“Mindy remarks that he does not see Nicely-Nicely Jones for a month of Sundays, and then everybody present remembers that they do not see Nicely-Nicely around lately, either.”) Less obvious – to the first-time reader – is that he rarely uses conditional tenses either. For instance, when a Runyon character intends to say “I would have laughed much more heartily if Joe the Joker had dropped dead in front of me”, he will say: “I will laugh much more heartily if Joe the Joker drops dead in front of me.” Isolated from context, this might be confusing, but once you get into the spirit of the stories, the writing develops its own rhythm and internal logic. In other stories like “The Old Doll’s House” (where a young man, on the run from extortionists, hides out in the home of an elderly, Miss Havisham-like woman late at night), "The Brain Goes Home" and “Lillian” – about a no-gooder and his alcoholic cat – the characteristic Runyon humour is laced with a tenderness that is all the more effective in this crime-ridden, cut-throat setting. I think some of his work could even be described as humanist noir comedy! I found this while googling 'Lilian'. As a big fan I wholeheartedly agree with you that "I can’t think of a Runyon story that isn’t worth reading". Have you read his Joe Turp stories?